Hello. 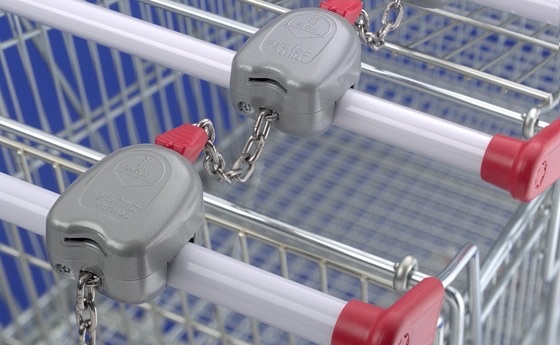 I’m a coin-tethered trolley and I will ruin your day. Hi. I’m a trolley and I’m here to destroy you. Check your pockets and find me a pound. Yes, yes. I know no-one carries cash anymore. Tell it to someone who cares. Haven’t you got one of those little keyring coins that proper grown-ups have? No? Ha ha ha ha ha! You TOTAL loser. A-A-Aaaaa. Naughty naughty. It’s no use trying to yank me backwards. I’m not going anywhere, my friend. Ouch! Don’t kick my ankles. That’s it. I’m tightening my grip on the other trolleys here. My crew have got my back, don’t you worry. Time to move away now, please. You could always try one of those baskets with the extendable handles. There’s no charge for them…. and that’s because they’re rubbish! Ha ha haaa! Those sissies never make it round a corner without tipping. Then it’s goodbye shopping, hello egg slick. You definitely need one of me instead. You could always ask that little urchin of yours to carry your stuff, though. I’m sure she won’t drop it, throw it or dump it in the middle of aisle 12 in favour of a pink plastic unicorn and some chocolate coins. Step aside now, joker. There are serious shoppers trying to get through. Hey hey HEY! Don’t use that language in front of the nipper. I’m only doing my job. Back off, now! People are starting to gather. Previous Previous post: Is that what I sound like?